Just done. Label and all. I’m pleased with how the quilt turned out. I like the contrast between the two muted background fabrics and the individual swatches – each is strong and colourful, yet they blend well. 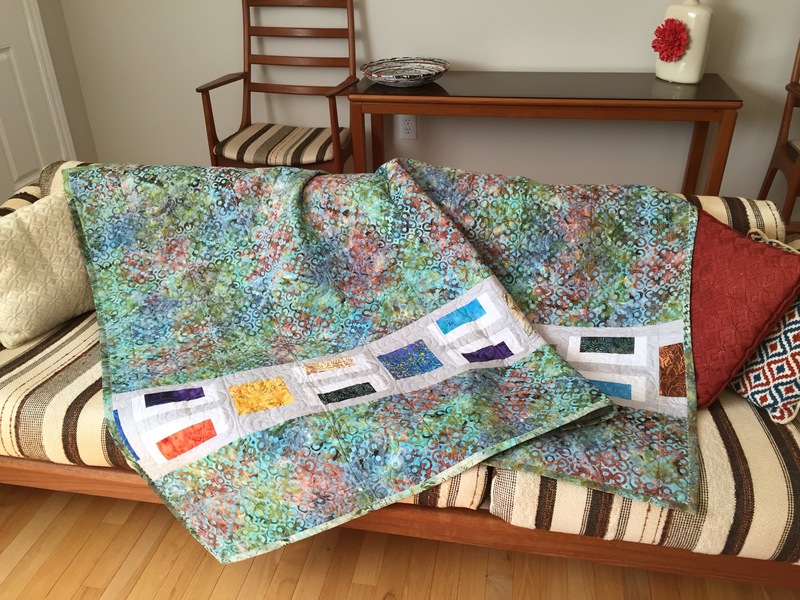 I wasn’t sure about the bold batik I used for the back – whether it complemented the insertion or not, but now that the quilt is completed I’m happy with the result. This quilt I think has found a home in my living room- it fits in better than the quilt I had there. 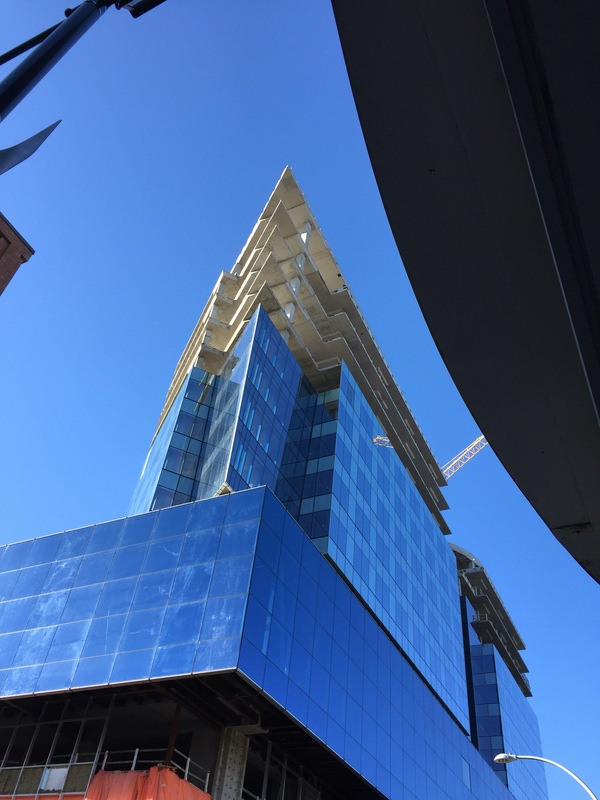 The face of Halifax is changing – another new building under construction. Love the prow shape at this end of the building. Couldn’t resist taking the photo as I was going into Neptune Theatre this afternoon to see 2 Pianos 4 Hands. The play was well done particularly the Bach duo at the end. Really enjoyed it. Too bad I didn’t remember to take a before picture – you’d have seen jeans that were very baggy in the bum with upper legs that were WAAAAY too wide! So here’s how this goes: I go to a local thrift store and buy a pair of jeans that fit nicely in the waist and high hip. That’s my starting point. The jeans cost me $5! There’s no point in buying new expensive jeans retail because they fit no better than those from the thrift store. Get the jeans home and wash them a couple of times to get rid of the smell (and to shrink them if they haven’t been worn a lot). I open the inner leg seam from knee, through crotch, to knee. I pin, then straight stitch, front to back through the crotch making sure I am cutting out about 2 1/2″ at the back crotch seam area tapering the alignment along the inner leg till the front and back match at the knee – I don’t cut anything at this point because I want to check fit before cutting. The fabric eventually removed from the back crotch and back inner legs looks like this – sort of triangular. 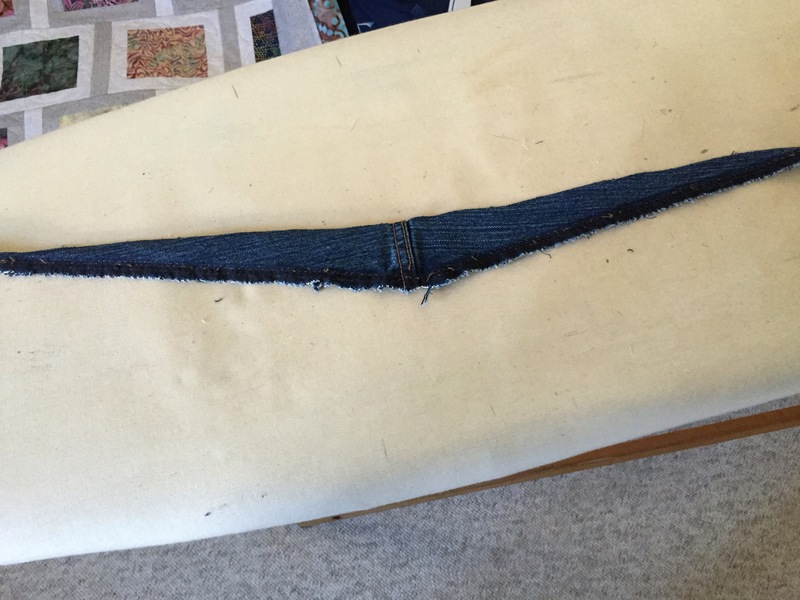 Once I’m sure of the fit (I may want to remove a bit more from the back crotch and back inner leg – a smigeon from the front as well) I stitch, cut, and serge the inner legs through the crotch, then edge stitch the seam flat. The back fits reasonably snugly with enough give for sitting. I shorten the legs – cut the length of the leg at the inner seam 28″ (enough to serge the edge and turn up a 5/8″ hem – my inseam is 27 1/4″). The front fits smoothly, not baggy. I make two other alterations – I carefully cut out the front grommet – they cut holes in my sweaters – patch, and reinforce the hole, sew on a button; the second alteration is to extend the depth of the right front pocket to hold my iPhone securely. This is an earlier pair adjusted to fit the same way. I’ve worn this pair a lot – they’re very comfortable. 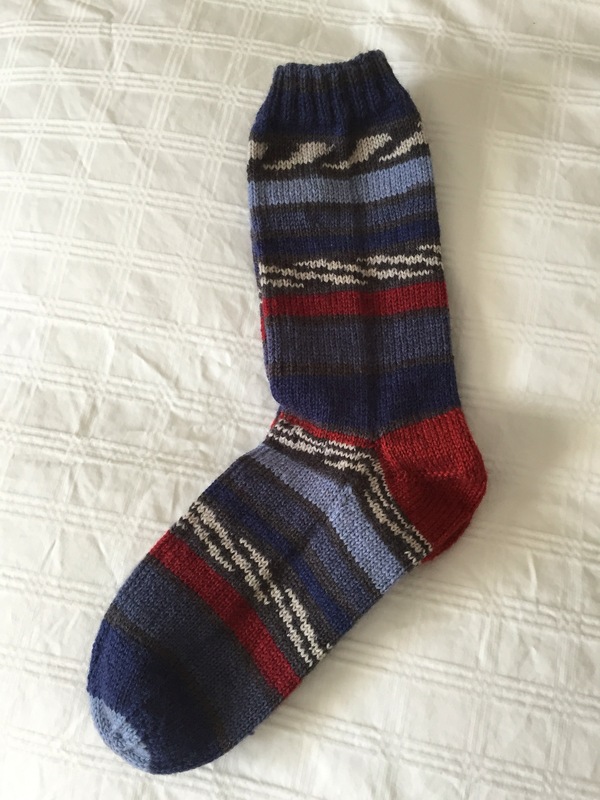 Finished last night – decided to continue with the variegated yarn for the toe rather than do it in red although I like how the heel (with stripe over the instep) in red ties the colour progression together. I’ve been out doing errands and have just come home. Since I’ve added a quilt to my living room sofa I’m much more inclined to stop and read for a bit here (why I didn’t that years ago is beyond me!). 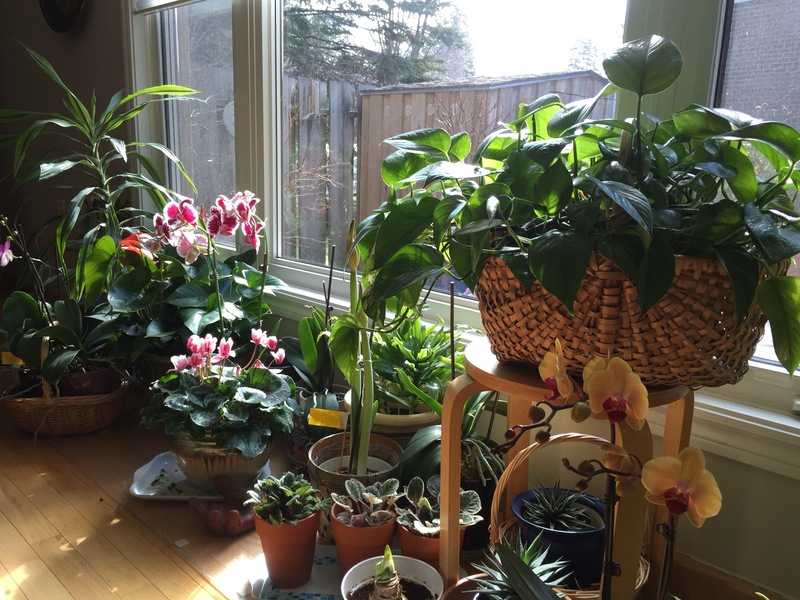 So I sat down to read, have taken a moment to enjoy the sun streaming in the large window and the plants lined up in front. I’d pruned away dead leaves and flowers on the weekend now they’re all looking happy. They’ll start responding to a longer day in a couple of weeks. One of the things I wanted the ladies in the quilting class to learn was how to look at pictures of quilts and deconstruct them. So I hunted for quilts I thought would be relatively easy to analyze. Among the photos I sent them was a charm quilt. “Charms” if you don’t know are precut pieces of fabric 5″ square. I had several charm packs (a charm pack is 40 of these 5″ pieces) in my stash and thought I should give the quilt a try. The original photo sashed and bordered the charms in alternating darker and lighter grey. I took my charms to the fabric store to see what would work with the charms I’d selected. Dark and light grey for the sashing was going to make those small coloured blocks pop. So I cut the strips I needed and quickly assembled the quilt top. What I particularly like are the vertical strips from one row to the next linking the rows. I made a few more bordered blocks, cut half of them in half to assemble a strip for the backing. The quilt sandwich is pinned and ready to be quilted. However I still had a large number of charms not used in this quilt so I thought I’d have a go at another quilt idea based on two blocks: half-square triangles and strips. 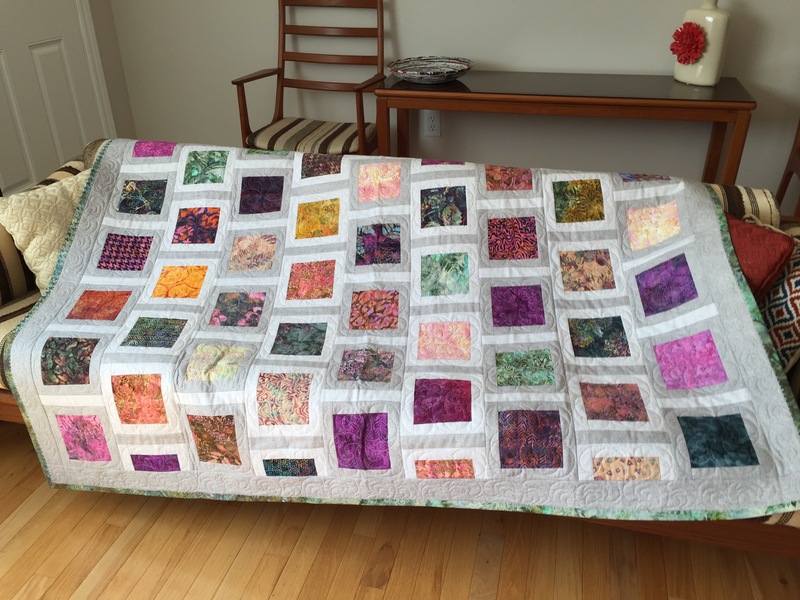 The quilt I had in mind would need 140 4 1/2″ blocks. So I made 70 half-square triangles and 70 blocks with 1/2″ strips down the middle. Here are the blocks laid out on my office floor. 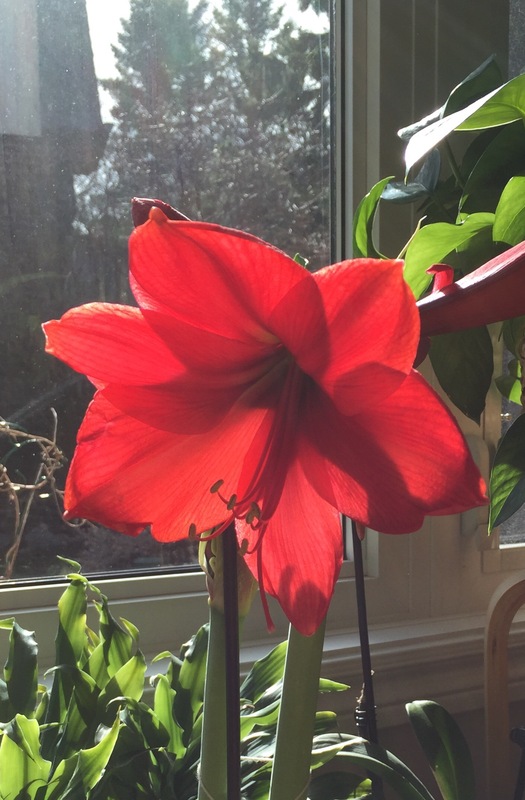 I’m still auditioning them – trying to find what for me is the most pleasing arrangement. That’ll take a day or two of coming back to look at the layout and tweeking it a bit more. Once sewn together, I intend to border the quilt with the darker grey fabric I used in the first quilt, backing and binding – I don’t know yet.